Scholastic chess tournament in Brooklyn this Sunday, November 23rd! Bird River Studios in Williamsburg has been very active in the local popularization of chess- we have after-school classes twice a week and regularly organize tournaments, which attract players of all levels with their fun&friendly atmosphere and the great trophy prizes generously given out to top 10 players in each section. The next tournament is going to take place this coming Sunday, November 23rd. There will be 4 rounds and we start at 10am in 3 different sections: Beginner (unrated, scholastic players under 14) , U-1000 (Rated,scholastic players under 14) and the Open Section (Rated,for scholastic players rated over 1000 and beginner adults). Games will be played using clocks in the rated sections with 30 minutes per player per game. Please go here for details and to register. Looking forward to seeing you at the board! Brooklyn Blitz Open this Sunday! After the great Brooklyn Chess Festival two weeks ago, we have another great chess event for you! This coming Sunday, Aug 24th, we are bringing a new exciting tournament to the New York chess scene- 7 rounds of blitz with time odds! The way it works is that we’re giving extra chance for lower-rated players to win by giving them more time than their higher-rated opponents will get. It is a novel idea which we hope to catch on. There are great money prizes with $400 for the winner and several class prizes given in various age groups. So, it’s this Sunday, Aug 24th at 4 at the New York Chess and Games Shop at 192 Flatbush Ave in Park Slope ( at Dean St, across the street from the Barclay’s Center). Click here for details and to register. You can’t miss it! Pictures from the B’ROOK’LYN CHESS FESTIVAL. 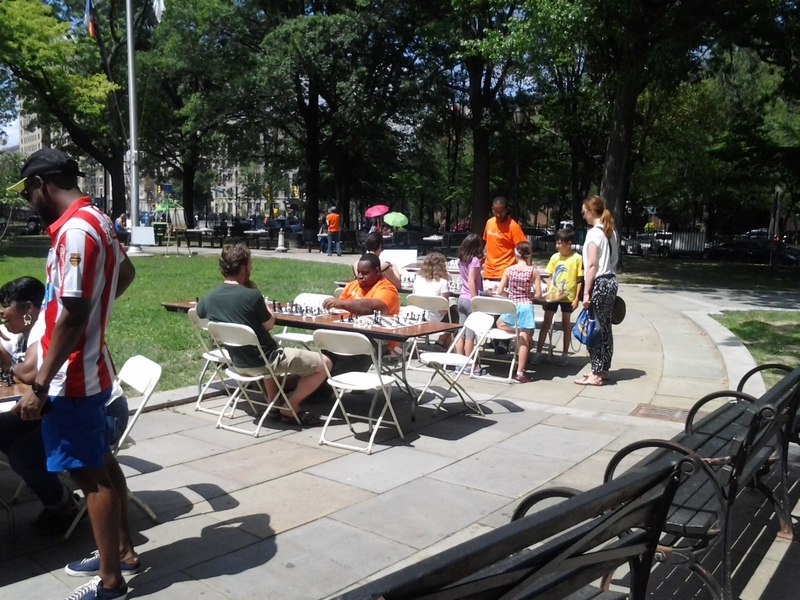 This past Saturday, Aug 9th, I was happy to help with running the wonderful free chess event – B’ROOK’LYN CHESS FESTIVAL in the Dr Roland McNair Park at Eastern Parkway organized by the New York Chess and Games in co-operation with the New York City’s Park Department. The attractions of the day for hundreds of participants included free lessons, a chance to challenge a master to a speed game ( I was one of the masters to beat- congratulations to all who made it!) and a simultaneous display by Grandmaster Giorgi Kacheishvili who faced opponents on 30 boards at the same time. It was a beautiful day and I saw a lot of people having a great day playing chess- you can see some of that fun on the pictures below. I’m looking forward to more events like this one! The simul area is ready for the participants. Early morning setup of the beginner section with free checkmate lectures. Master Azeez with his board set up for everyone willing to challenge him. Azeez and other masters (Pavel, Andrey and Simon) were challenged to games all day . GM Giorgi Kacheishvili at the beginning of the simul. Few players ended up drawing with the strong grandmaster. Orange juice is known to help in playing good chess. Young participants anxious to see what the grandmaster will play in his first move. Pavel and Andrey holding the fort in the “Play the Master’ area. “The Skittles Pit” was very popular , players of all ages enjoyed casual games in the beautiful summer weather. Free lessons were popular all day. More of the action from the Skittles Pit. The man behind it all- Christian Whitted, the Director of the New York Chess& Games. Two great chess events in August!! I’d like to let you know about two exciting chess projects that I’m currently involved in with my friend Christian from the New York Chess and Game Shop in Park Slope- the are both scheduled for August, so mark your calendars please. 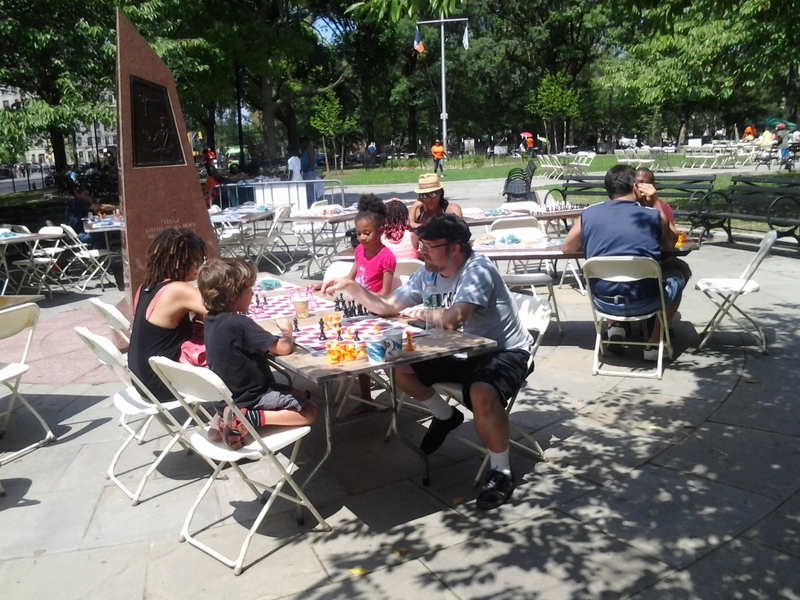 Summertime is perfect for playing chess outside and therefore on Aug 9th (Saturday) from 10 to 4 we will be hosting a B’ROOK’LYN CHESS FESTIVAL in the Roland McNair Park at Eastern Parkway& Washington Ave (across the street from the Brooklyn Museum). 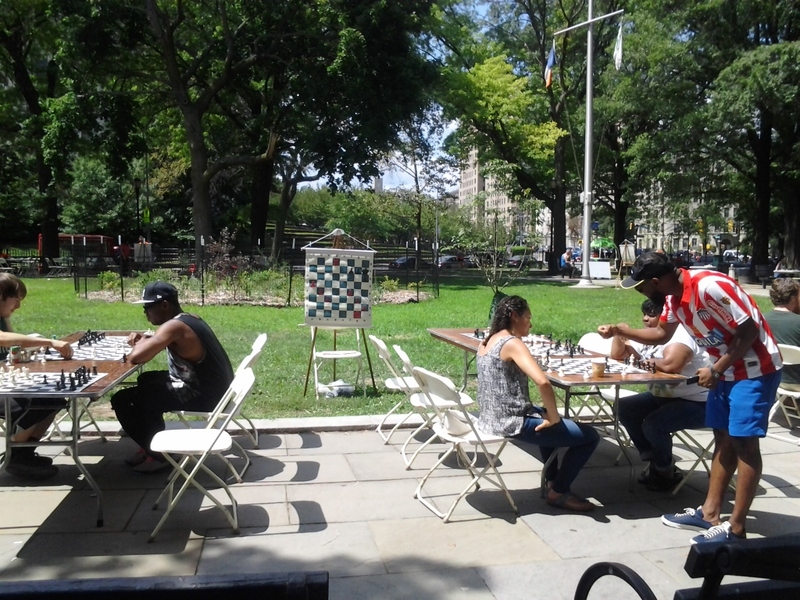 This is a FREE event organized together with the NYC DEpartment of Parks and Recreation and the activities will include free lectures, play a master challenge, free play for all participants and the main attraction will be a simultaneous exhibition by Grandmaster Giorgi Kacheishvili who will play against opponents at 30 boards. Click here for the details! And on August 24th we are organizing a speed chess tournament with special rules! We called it The Equalizer because it gives extra chances for the lower-rated players to win- if you are lower-rated player than your opponent, they will get less time on the clock! This is a great chance to beat the players rated few hundred points higher than you! This is an event with a $50 entry fee and there are great money prizes- there is $1000 in the prize fund for the winners in several categories- including prizes for the top performers in U-18 and U-12 groups. 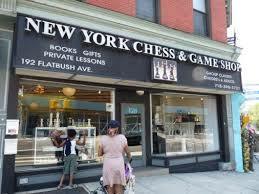 The event will take place at the New York Chess and Games Shop, which is located at 192 Flatbush Ave (at Dean St. across the street from the Barclays Center, close to all the trains that go to the Atlantic Terminal. Click here for the details and to register. August sounds like a lot of fun, and I hope you will join us! Chess tournament and a simultaneous chess exhibition this Sunday in Williamsburg, Brooklyn. Bird River Studios in Williamsburg, Brooklyn will host another tournament this Sunday- June 22nd. Players will compete in 3 different categories- Open, Scholastic U-1000 and Beginner/Unrated , there are beautiful trophies to be won and experiences to gain. Kids love playing and winning trophies and we love to see their passion for chess, so we’re looking forward to the event. Also, the Open section gives a chance for the beginner adult players to join the tournament circuit (better late than never!) and earn their first rating points. This time, we have a special attraction for all the players- after the event we will host a simultaneous chess exhibition- FIDE Master Andrey Krasnov (rated 2272 USCF) will challenge all of the participants (at no extra charge) who think that they can try and beat him:)! This is a great opportunity for all the players to face a very strong opponent. Both the tournament and the simul are going to be a lot of fun- if you haven’t registered yet, you should! Please go here to sign up. See you at the board! Register now for the summer chess camp for kids in Brooklyn! CHESS CAMP FOR KIDS IN BROOKLYN! DATE: From 6/30 till 7/3 (4 days), from 9 to 3 every day. Camp ran by expert-level players, two daily instruction sessions, supervised training games, and tournaments. Classes for players of all levels, from absolute beginners to advanced. Players bring their own lunch. or call the JEI Center. Upcoming scholastic chess tournaments in New York City! tournament participation is important to your young players, so they can practice the skills acquired at lessons. While I’m still arranging the dates for my own tournaments, I thought it would be useful to share the information about the upcoming events elsewhere in the city. My friend Ian West, who is a coach at the PS 139 school in Ditmas Park, is organizing a free tournament on Sunday next week (4/27) . Please click here to register. There will be rated and unrated sections available, so all levels of players are welcome. Chess Educators organization has tournaments coming up for you on Saturday next week (4/26) in Jackson Heights and on May 18th in Manhattan. Please click here for the details. There is a tournament on Upper East Side at PS 6 on Sunday next week (4/27). Please click here for more information. Chess in the Schools organization’s tournament calendar can be found here with tournaments scheduled for April and May. Marshall Chess Club in Greenwich Village hosts tournaments every day- while most of them are for pretty advanced players, I would encourage you to check out their calendar – playing in an under-1600 section on Saturdays or Mondays should be a very good experience for ambitious scholastic players. There is a wide variety of opportunities for kids to play in New York City- please take advantage of them and have fun!